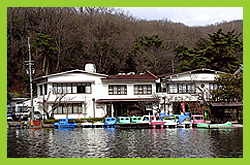 Located at the Northernmost tip of Kongo/Ikoma/Kisen quasi-national park, Kurondo-sou is a tourist ryokan (Japanese style inn) by the scenic mountain pond, Kurondo Pond. The inn is boasting culinary delights such as wild boar casserole and other delicious seasonal cuisine. You can also barbecue yourself! From the Kintetsu-Keihanna Line, Please get off at "Gakkenn Kitaikoma" station, and take the Nara Kotsu bus or take taxi for 15min. Alternatively, take taxi for 25min. from "Kisaichi" station of Keihan Katano Line.